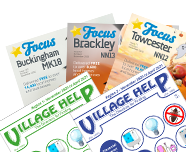 We are able to offer leaflet distribution with all our magazines, with the exception of Focus Buckingham MK18. This is a popular option for many businesses, so we advise to book well in advance. There is availability for a single A5 leaflet per magazine issue. Leaflets must be received by the 18th of the month proceeding delivery. The price is £39 (+vat at the standard rate) per 1000 delivered, and is payable in full upon confirmation of your booking. Please call 01327 353753 to make a booking. Dates and quantities required can be found by checking our Deadline Dates and Distribution Areas. We are able to offer a leaflet design service, please call 01327 353753 to discuss your requirements. Why not check out our Printing section too, and let us take care of everything for you. If you are looking at delivering anything other than an A5 leaflet, please call 01327 353753 and we will do our best to accommodate.